Play Stampede Slot Online with 500 Free Spins! Stampede is a 5 reels, 243 paylines Online Slot Game by Eyecon. Stampede slot has Free Spins, Scatter symbols features and an RTP of 95.2%. Stampedes are normally best to be avoided, but in this case, Eyecon has decided to encourage you to charge head-on at the rampage and be rewarded for it. Stampede Jackpot is a 5 reels, 3 rows slot. The symbols in this slot take the shape of various animals as well as various other symbols. Each of these symbols has a different numerical value depending on the number of symbols involved in the same winning pay-line. 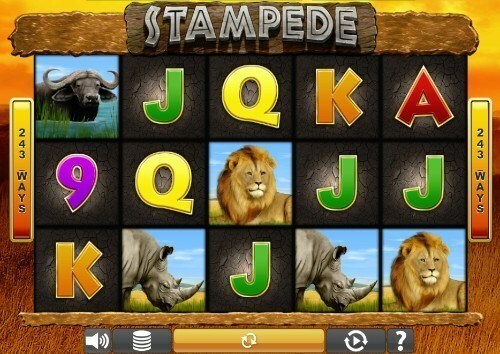 Stampede is a very traditional slot in many different aspects, in both design and gameplay. Did we also mention that this slot can be played on mobile devices? No? Well, now you know. There are a lot of sites to choose from in terms of where you can play Stampede, although we would highly recommend one plays this on RoseSlots.com: a site with a lot of upsides. These guys are a UK based online slot company housing hundreds of slots to choose from. Founded in 1997 as a computer game company, Eyecon has been creating online slot and online scratch card games for well over a decade. After releasing their very first slot game: Temple of Isis slot game in 2003, the company has gone on to create some of the most memorable online gaming experiences across the globe with no sign of slowing down. If you’ve played any online slot then you will know of the significance of this developer, and the overall impact they’ve had on the industry as a whole. Other top Eyecon slot games include Legend Of The 5 Ninja slot and Heartburst UK slot. As we’ve already stated above, the pay-lines in this slot are not fixed allowing multiple different wins and encouragement multiple spins on the reels. There is a total of 243 ways to win in this stampede. If you are anyone who understands slot gaming then you will understand the beauty in sitting back and watching the money just pour in, almost stampede like. One should expect all of the telltale signs of an online slot, what that means essentially is that one should look out for wilds and scatters on-top of other outstanding features. There are a variety of bonus features to explore here. Free games are but one example of an approach one can take to reach those high scores. In this slot, however, players have the opportunity to choose the free games they wish to play, thus adding more incentive to keep playing to try out every possible way of playing to find what fits you. Hitting 3 elephant symbols will allow players to re-trigger this mode as many times as they like. The sun symbol that appears on the 2nd, 3rd and 4th reels only, substitutes certain symbols thus creating more pockets of success! Eyecon presents an online slot with an astonishing 1024 winning lines, boasting 95.26% RTP. The game, which takes place on a 5x4 layout of reels and rows, is inspired by the beautiful landscape of Africa and the creatures that live in it. Free spins and a ‘Double Up’ bonus are on offer to players, who can enjoy it here at Rose Slots. Of all the choices you can make when deciding where to go on holiday, a safari is one of the most exotic. There’s a lot to be said for getting back in touch with nature, and some of the world’s wildest and most wonderful animals just have to be seen to be believed. Eyecon’s Stampede offers you that experience as the backdrop to a big, bold and beautiful slot game, with fantastic visual flair and atmospheric sounds, from the African music down to the calls of the wild animals themselves. The designers of Eyecon must have clocked in a lot of overtime when they were making Stampede. The world of the game is stunning, set against a well-rendered backdrop of the African plains, where the sun is setting in the sky, and the mountains roll away towards the horizon. The colour scheme is vibrant and earthy, with the reels set into an ornate wooden frame that complements the theme. As you'd both hope and expect to find in an animal-themed game, there are plenty of wild beasts on the reels, all of which have been expertly realised in a life-like fashion. You'll see plenty of them too; the 5x4 layout of the reels is bigger than your average. That allows for more winning lines, and with 1024 of them to play for you should find that Stampede will give you at least small wins on a regular basis. Looking at the symbols themselves, the lowest values are covered by the traditional playing cards 10, J, Q, K and A, but what you really want to see is the cast of animals, who are more valuable. Creatures of both the land and the air are represented, with giraffes, eagles, zebras, gazelles, leopards and, most importantly of all, African elephants. You probably already know that when elephants run in groups, it's referred to as a ‘stampede', and in this game, the elephant will do exactly that. If you're able to trigger the bonus features, it will break away from the reels and come running straight at you! This may be the only situation you'll ever encounter in life where you actually want an elephant to run at you though; as well as acting as a trigger for the bonus, the symbol stacks, and can combine to generate big payouts. The wild in the game is represented by wooden pallets, replacing everything other than the scatter to contribute to winning combinations. The scatter itself is represented by a group of savanna trees. Eyecon put a lot of thought into their online slot games. When they think the situation calls for it, they’ll add in a wide range of different bonus features to freshen a game up and make sure it offers variety. Other times, when they think keeping things simple is more important, they’ll restrict themselves to one or two, and make sure they’re done well. That’s the approach they’ve taken with Stampede; there are only two bonus features, but they’re well worth chasing. The first is Double Up, although it would be more accurately be called a gamble feature, and that's how it's referred to on a number of other Eyecon games. The premise is simple; when you've found a winning line, you have the option to take a ‘double or nothing' bet based on a 50/50 choice to increase your prize. Choose correctly, and your last win is doubled; make the wrong call and your prize is lost. There are a number of ways a gamble feature can be represented in an online slot. In Stampede, it's a plain and simple coin toss. If you're feeling extraordinarily brave and lucky, you can seek to double your winnings up to five times in a row. The main bonus feature, though, is the Free Spins round. Usually, rounds like this are triggered either by the scatter or the wild symbols. In Stampede, fittingly for the game's theme, it's the elephant that holds the key to the door. Any time you spin and land a minimum of three elephants, the feature is triggered, and you're presented with another choice. You can either have comparatively few spins with a high multiplier (the maximum being a 10x multiplier for five spins) or a lot more spins with a lower multiplier (the maximum being twenty spins with a 2x multiplier). Whether you want to go for big wins over a short burst or play slow and steady is up to you. There are two other perks that come with free spins; firstly the round can trigger again if you land another three elephants during your free spins, and secondly if you create a winning line using a wild during the spins, it will be multiplied by a further factor of 2 or 3 on top of whichever multiplier you chose in the beginning. If you’re on a lucky streak, that can mean some seriously large payouts. There aren't many online slot developers out there who can claim to be a well known, or to have as many regular players as Eyecon. The dynamic company have a reputation for excellence, backed up by their habit of creating strong character-driven games, and innovative bonus features. Both of those are habits that they probably picked up during their distant past when they designed ‘regular' video games instead of slot games. As the 21st century drew towards a close, Eyecon's most prominent success had been with a survival horror game called ‘Gore', which had more in common with Resident Evil than it did any slot game they've made since. The game wasn't available in many shops but became wildly popular online, where it was downloaded several million times. From this, Eyecon deduced that players were beginning to embrace the internet, and they decided to transition into developing online slots during 1999. It took a few more years before Eyecon had settled on how they wanted to present their online slot games, and also for enough potential players to have the internet in their homes for their releases to be a success. In 2003, deciding the time was right, they released a game called Temple of Isis, and since then they’ve never looked back. That first-ever game is even still available to play today, although it’s been re-named to Temple of Iris. Creating games that last for years is something that Eyecon know more about than most; you need only look at the success of Fluffy Favourites to find evidence of that. Fluffy Favourites, released in 2006, is Eyecon's magnum opus. No matter what further success they go on to achieve, it's doubtful they'll ever be known for anything more than they are the Fluffy Favourites series. Set in a fairytale world where cute and cuddly stuffed toys come to life, the game captures the hearts and minds of players from its very first day of operation. Now, it's the centrepiece of a whole Fluffy Favourites empire, featuring multiple sequels and other tie-ins. Chances are if you've played slot games before, you've played Fluffy Favourites. If you haven't, then we highly recommend it; it's one of the most popular games we offer to players here at roseslots.com. Eyecon operates from two offices; one in Guernsey, and the other in Australia. That means that no matter what time of day it is, there are people awake and working for Eyecon. That kind of round-the-clock availability might be the reason why they're releasing new games more regularly now than they ever have in the past. There are currently sixty active games on the Eyecon roster, but that number can be expected to rise sharply in the years to come. “There are loads of wild animals in addition to loads of wins in Stampede Slots, so spin it to win it today! The ‘animals and nature theme' is a popular one with developers, and so it may come as a surprise that Stampede is Eyecon's only entry into the genre. They're generally better known for their cute and friendly themed slots; with Fluffy Favourites being their best-known title, and so Stampede stands alone on their roster as having a more ‘serious' animal driven theme. They do, however, offer a ‘jackpot' version of the game. Stampede Jackpot: When a developer creates a ‘jackpot' version of a game, the usual approach is to keep absolutely everything the same, and link the original up to a progressive jackpot. That means the top prize on offer to players is much, much higher than it is in the ‘normal' version of the game. That's exactly what Eyecon have done with Stampede Jackpot; the sounds, appearance and functions of the game are identical in every way to the ‘regular' version of Stampede, but there are two key differences in the mechanics. Firstly, the RTP drops away to 89.9%. That's not uncommon in jackpot games; because the top prize is so much higher, the game pays out less often. That's the price you pay for chasing after a bigger pot of money! The progressive jackpot feature can trigger at any time during regular play. When it does, players are aiming to win one of a number of linked jackpots, the largest of which is worth several thousand pounds. While Eyecon has mostly stayed away from the animals and nature theme, there are many other developers who've made it their calling card. We offer a range of them here at Rose Slots; games that have been selected not only because of their theme but because of their quality. Here's a quick guide to the alternatives you may wish to consider. Hot Safari: If Stampede is an online slot game that focuses its attention on the elephant, Hot Safari allows all the other animals of the African outback to have their time to shine. This is a slot game by Pragmatic Play, and while it may be by a different developer, it has many things in common with Stampede. One of those is the attitude towards bonuses; there isn't a huge number in this game, but the ones that have been included complement the base game well. We don't find it to be as visually attractive as Stampede, but this is a robust and playable game with 69.17% RTP. We don't think this is likely to become your new favourite game, but it can be a fun one to play when the mood takes you. Wolf Gold: Arguably the best-known game on Pragmatic Play's whole roster, the award-winning Wolf Gold has won awards and received almost universal praise from the gaming community. Like Stampede, it's an atmospheric slot game with wildlife at its heart, but Wolf Gold uses North America as a backdrop instead of Africa. That means plenty of coyotes and canyons, as well as a hint of Native American symbolism. A combination of multipliers and free spins contribute to a good bonus features offering, and RTP comes in at 96%. Wolf Gold is an exceptionally great online slot, and well worthy of your time. Great Rhino: Pragmatic Play is more than making up for Eyecon's lack of animal-themed games; this is their third! Great Rhino is a recent game, and another one that has led to a great deal of acclaim for the studio. If the elephant is the star of Stampede, then Great Rhino is the game where the noble rhino puts it in its place. The play takes place on a traditional 5x3 set of reels and rows, with 20 paylines to play for and 96.53% RTP. This is a great looking, highly-playable game that's proven very popular with our slot players. Jungle Spirit Call Of The Wild: Having assessed all the wildlife-themed games available from Pragmatic Play, here's one from Net Ent. They're another major developer, and rarely disappoint when they have a significant release to present to the public. Whereas the visual style of Stampede is colourful and playful, Call of the Wild is darker and harsher, giving you a feel for how scary the animal kingdom can sometimes be. It's also a generous game; there are 243 paying lines and a high RTP of 96.47%. Two primary bonus features, along with expanding wilds, make it a deep and complex game which might not be to everyone's tastes. Savannah King: Jungle Spirit Call Of The Wild makes things more involved than Stampede; Savannah King does the opposite. Tom Horn Gaming is responsible for this slot game, in which the simplicity of the presentation is part of the joy. It's a typical 5x3 layout with a modest 15 paylines, offering 96.41% RTP to players. Savannah King is intentionally light on bonus features; it's a online slot you can just pick up and play without having to do any reading, or going through a trial and error process with working out how the extra features work. It still offers a little excitement and variety through the way wilds factor into your wins. Eyecon almost always does well with adapting their online slot games for play on a mobile device. Every time you play an Eyecon game, you can almost feel all the love and care that went into making it. What we're expecting to find when we load Stampede on our smartphone is a seamless conversion that plays just as well on a hand-held device as it does on a laptop. Needless to say, that's exactly what we found. There's been no reduction in the quality of any aspect of Stampede as it's made the journey from one medium to the other. All the graphics are still bright and sharp, the sounds effects are just as crisp, and nothing's been cut out at all. Intelligent programming means that whichever way up you’re holding your phone, the display will rearrange itself accordingly. Tilt your phone to the side, and the buttons will rearrange themselves to fit better without getting in the way of the reels. Flip it back up the right way, and they go back where they began. The game doesn’t pause or stop to make these changes; everything keeps running perfectly. Crucially, no matter which way round you’re holding your device, the reels don’t get shrunken down to a point where you’re straining to see them. The scaling has been done just right, and you can play the game in comfort without giving yourself a headache. As they seemingly always do with their games, Eyecon has got the mobile version of Stampede spot on. If you love playing the game on your computer, you'll have just as much fun playing it on a smartphone. Even with a studio as well known as Eyecon, there's no guarantee that every new game you make will generate significant amounts of press. Stampede is still quite a recent release, so it's possible that the industry and mainstream press just haven't caught on to it yet. It's also possible that it was released at the same time as a more significant game somewhere else, and so it escaped people's attention. Nobody seems to be writing about Stampede at the moment. We don't think that has to be a bad thing. In fact, we think it makes it a hidden gem. We all encounter hidden gems at some point in life. Sometimes we’ll see a band playing a small venue before anybody knows who they are. Other times, it’s an independent cinema release that nobody noticed because they were all queuing for the latest blockbuster. We think Stampede is a great game, and if more people haven’t noticed that yet, it’s their own loss! If you’ve never been on safari, and you don’t have any plans to do so in the immediate future, then sitting down and enjoying what Stampede has to offer might be the next best thing. It’s an exciting online slot with plenty of ways to win, and makes excellent use of its theme to provide you with an immersive gaming experience. Ready to play it yourself and decide whether you agree with our review? If so, we’d love you to stay with us, and play it on roseslots.com. We're all about variety here. That's why we have a massive catalogue of 600 leading online slots for you to choose from, including something for every taste. If you want something with plenty of bonus features and side games away from the usual spinning of the reels, we have you covered. Equally, if you're more interested in jumping straight into something where you can just play without having to learn how all the bonus features work, we can offer you that, too. Everybody is welcome here, and everybody is catered for. Signing up with Rose Slots today could get you up to 500 free spins, with more free spins on offer every time you deposit £20 or more into your Rose Slots account. That's on top of the weekly cashback incentives we make available to regular players. We're always looking for new ways to reward our players because we're always grateful for your custom! Great games, great rewards and great times; that's what Rose Slots is all about.